Rotherham-headquartered business process and technology specialist, Parseq has appointed Tony Strong to lead its management team. Stong joins the recently re-branded Parseq from Communisis where he doubled turnover over the last five years in his role as group operations managing director responsible for 2,000 staff and 14 locations across the UK. Parseq recently announced a £1m investment to develop and expand its UK workforce following the firm's launch of its new identity and plans for market growth. Earlier this year, the firm announced a pilot partnership with the skills provider, the National Sales Academy, which will enable its 1,500 employees in Rotherham and Sunderland to gain access to £3,000 worth of educational funding each. David Carman, chairman at Parseq, said: "Tony is used to working in multi-disciplined, highly regulated environments, he understands our clients' businesses and has a great affinity with the people on the shop floor because that is where he started his career. "We are delighted to welcome Tony to the Board of Parseq and look forward to working with him as he supports our divisional managing directors to build our client relationships. His total focus will be to put us in a different and differentiated league to our competitors." 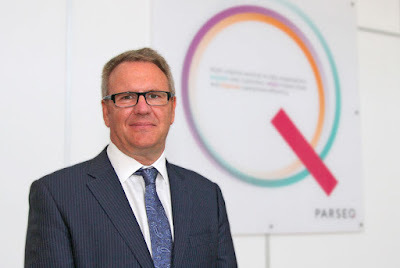 Tony Strong, chief executive officer at Parseq (pictured), said: "I plan to focus on three key areas to achieve our ambitions: attracting and retaining the best talent, profitable growth and operational excellence. "Parseq has already invested a significant sum in the last six months improving the support we provide to our people through development opportunities, including Lean and Six Sigma qualifications. We have unveiled a new brand which categorises and measures all of our employees performance by linking their job roles to the service they provide for our clients which are to: acquire new customers for our clients, retain existing customers for our clients or improve internal client processes." Parseq was created via a successful reverse takeover by Rami Cassis and Rotherham-based BPO provider, Documetric in 2010. The £33m management buy out was led by Cassis, together with Nova Capital and funds managed by HarbourVest Partners, LLC. Parseq is aiming to be a business with a £100m turnover in three years.